Lock in a great price for Holiday Inn Express Beijing Dongzhimen – rated 8.5 by recent guests! Excellent location if you want to travel around in Beijing. Hotel facilities are according to international standards. Staff speaks good English and makes it more comfortable when communicating. Upon arrival they welcome you with cookies when you have booked through booking.com, very nice gesture! The staff is very kind and efficient, the location is good. The facilities are clean and modern. Breakfast big and very nice. Clean, staff knowledgeable and spoke good English, location OK, breakfast good. Room small but excellent. Nice pillows. Friendly and helpful y staff at reception and restaurant. The welcome cookies and drinks that’s a touch of class. The location, the breakfast, Harry's Bar and the gym are worth the stay alone. But the rooms are just SO SO. Fabulous breakfast. Nice staff. Very clean, quiet, well appointed rooms. Value for money. First of all the staff in the hotel are well mannered, very soft, helping and kind. All of them could manage to speak reasonable english. Breakfast the room, cleanliness everything was outstanding. What impressed me the most is the staff who are very very polite and warm. The ambiance of the hotel is so good . The full premises smells good. Very good gym and everything about this hotel is rated very high. I will surely go back to this hotel . One of our top picks in Beijing.Ideally located in the embassy area, Holiday Inn Express is around a 15-minute walk from the popular Sanlitun Bar Street. It provides modern rooms with free internet. Guests have free access to the fitness center and free use of the massage armchair. Holiday Inn Express Beijing Dongzhimen is around a 15-minute walk from Dongzhimen and Dongsishitiao Subway Station (Line 2). It is around 5 mi from Tiananmen Square and the Forbidden City. Capital International Airport is around a 30-minute car journey away. Tour bookings and ticketing services for families are available at the travel desk. Added conveniences include an ATM and laundry services. Guests can enjoy free access to the 6 computers at the business center. When would you like to stay at Holiday Inn Express Beijing Dongzhimen? Furnished with carpeted floors, air-conditioned room has a flat-screen TV, iPod dock and sofa. Bathroom has a shower and hairdryer. Located on higher floors, this twin room features a sofa, iPod dock and satellite TV. Located on higher floors, this double room has a cable TV, air conditioning and iPod dock. Welcome to Holiday Inn Express Beijing Dongzhimen.We would like to wish a pleasant stay with us and please do not hesitate to contact us via hotel operator should you need any further assistance throughout your stay. House Rules Holiday Inn Express Beijing Dongzhimen takes special requests – add in the next step! Greatwall Peony Dragon Jin Holiday Inn Express Beijing Dongzhimen accepts these cards and reserves the right to temporarily hold an amount prior to arrival. Holiday Inn Express Beijing Dongzhimen accepts these cards and reserves the right to temporarily hold an amount prior to arrival. Ms Iris attending to our check in was very polite and helpful. The provision of the massage chairs outside the gym was excellent especially after a trip to the Great Wall of China! The location was great, 15 min walk from Dongzhimen subway and bus hub. The TV reception for HBO was very poor. The comfortable rooms, free breakfast and great location in an interesting Beijing neighbourhood. Nice Location, good bed.clean.nice stuff. The staff is very nice. 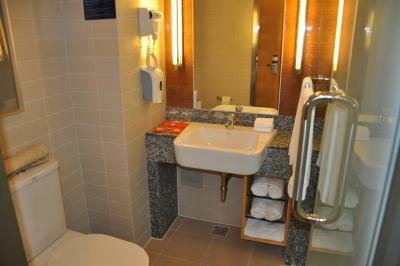 Facilities are excellent, although the hotel is a little bit far from the city center and metro station. A/C never work properly,the personal control the compressor . The room was so hot all the time , And the A/C didnt work. The breakfast was so poor a lot of sausages and bread. The omelette just have onion and tomato. Room is a bit small for 1 adult and 2 children(10 and 11). Everything is ok except this. The staffs are very considerate and helpful. Always do what they can do to help. The breakfast is of good variety and delicious. It is absolutely value of money to stay at this hotel whenever i go to Beijing.